Modern organizations commonly face the question of how they are going to manage their internal user identities. This problem arose because of the new innovations in the world of technology. With SaaS-based applications, cloud infrastructure, and the growing amount of mixed platform environments, all of these variables are creating challenges that need to be addressed. Historically, one of the common methods that has handled this type of identity management is LDAP. Unfortunately, LDAP has started to break down in these scenarios today. There are various reasons why, but the main culprit is the world’s move to the cloud. LDAP was designed to function with on-prem applications, and now that we see products moving off of the on-prem infrastructure it is beginning to lag behind. There is a new approach that can be taken towards LDAP though that helps with this issue. This approach is to use SaaS-based LDAP from JumpCloud’s Directory-as-a-Service® platform. Our cloud-based directory allows you to move your LDAP infrastructure to the cloud, so you can regain control over the on-prem and cloud applications that had previously caused challenges. With benefits like always-on capabilities and standard APIs, there are plenty of positive aspects of the change. 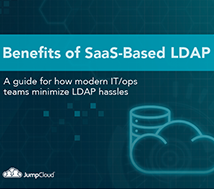 To help break down why you should try SaaS-Based LDAP, we wrote an ebook titled: Benefits of SaaS-Based LDAP. This book goes into more detail about the areas where conventional LDAP falls short, in addition to explaining more modern approaches and how they can benefit organizations. You can check it out by clicking on the image below. What Can SaaS-Based LDAP do for you? Many of today’s most innovative organizations leverage cloud-based services for nearly everything. The reason is simple: SaaS services reduce hardware and maintenance costs while allowing businesses to re-focus all of their staff towards their core mission. One of the only pieces of IT infrastructure that has remained on-prem is the directory, until now. Hosted LDAP, otherwise known as LDAP-as-a-Service, has moved LDAP to the cloud and made the entire process easier for IT admins. No longer do admins need to worry about the setup, maintenance, or availability of their servers. That is all managed by JumpCloud, allowing IT organizations to get back to the core focus of their company. All that is needed from you is to simply point your applications to the virtual LDAP server. 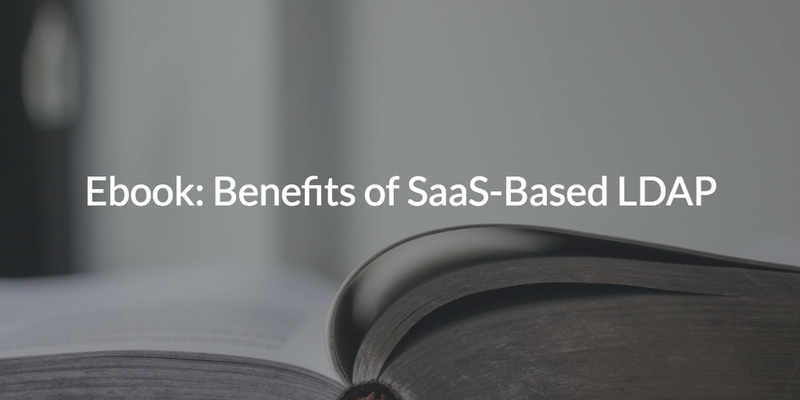 If you would like to learn more about the benefits of SaaS-Based LDAP, reach out to us. We would be happy to talk about whether or not a cloud LDAP server could be right for you. You can also check out the above video, which details how LDAP-as-a-Service works. Alternatively, you can sign up for a free Directory-as-a-Service account to see how the hosted LDAP feature works for yourself. Your first 10 users are free forever – no credit card required.